Feeling bloated from holiday parties? Greasy, fried and raw foods are known to increase Gas in the body, aggravate Vata dosha and result in significant gastric upset. Well, Ayurveda has a 5,000 year old solution to this problem – the Herb “Hing.“ Also known by its latin name of “Ferula assafoetida” or “Asafoetida,” this herb works wonders on your holiday or anytime gassy meals. *Specifically, Hing is known to reduce the growth of some of our gut microflora and therefore reduce flatulence. Hing has a onion-garlic-sulfur smell to it before you add it to foods, but when cooked, the scent mellows out significantly and presents a mild leek-like flavor to your food. It is a classic spice in Indian food and can be easily extended to season any type of cuisine including Italian, Mediterranean, German, Spanish, Polish, Asian or British cuisine. The most natural and pure source of Hing that I have been able to find is from Frontier Spices. 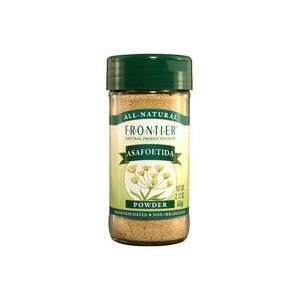 This brand is known for its organic and pure sourced spices and one I trust and use regularly. You can find it at health stores such as Nature’s Corner in Spring Lake, NJ or sometimes Whole Foods across the country. If you cannot find Hing, you can email us at Veda Healthand we will procure some for you. Cost is typically $6-7/bottle and it lasts at least 6-8 months since you only use a pinch per dish. ← Culinary Spices & The Doshas!